USB 3.0 Male to RJ-45 Female Black Adapter is a USB 3.0 to Gigabit Ethernet Adapter. 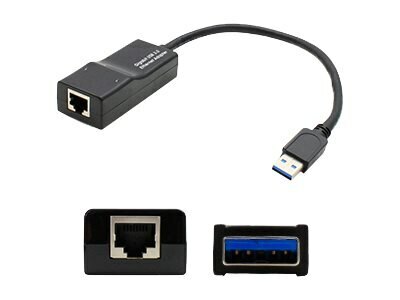 It allows you to connect an RJ-45 ethernet cable to your system through any available USB 3.0 or USB 2.0 port, and offers a full gigabit connection. Additionally, it supports Wake-on-Lan and Green Ethernet, and is compatible with both Windows and Mac OS.